Our daughter’s remodeled bathroom will soon be getting it’s moment in the spotlight. 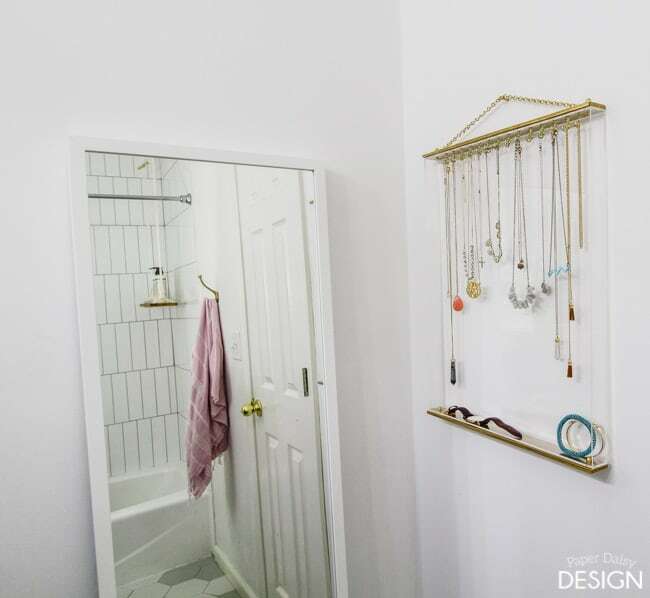 And as cool and hip as her bathroom has become, sometimes it is the little projects, like this jewelry organizer, that add a bit of personal style and flare to a space. It also doesn’t hurt that she now can keep her growing collection of necklaces and a few key pieces of jewelry neat and tidy. 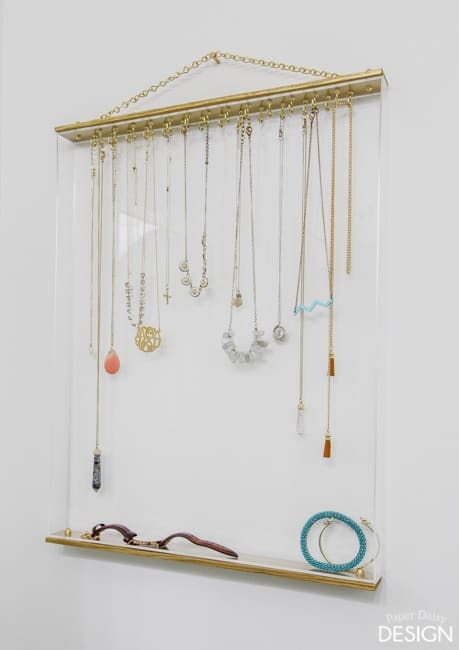 She came to me with a vision of an acrylic framed necklace organizer, but it was up to me to figure out how to make that vision become a visually appealing and a practical reality. I knew that just adding hooks to an acrylic frame wasn’t going to give her the simplistic look she ultimately desired. Adding just a hint of gold framing at the top and bottom of the acrylic was just enough to hide all the working parts. Esthetically, the gold trim also made us extremely happy, because what girl doesn’t like adding a bit of bling to acrylic? 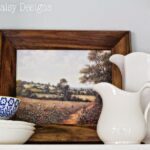 Making your own acrylic organizer is fairly simple, although you do need a few basic tools and a bit of patience. Begin by cutting your pieces of lattice molding to 16″ or exactly to the width of the outside of your acrylic frame. Spray paint them gold. To cover the wood and get the desired shiny finish, it will take several coats or would likely benefit from a coat of primer first. I didn’t have any on hand, so I just kept reapplying the paint. 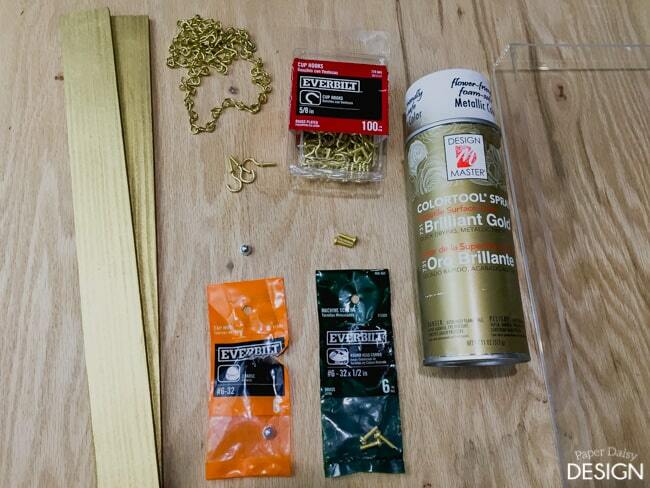 Spray paint the cap nuts and nuts gold. 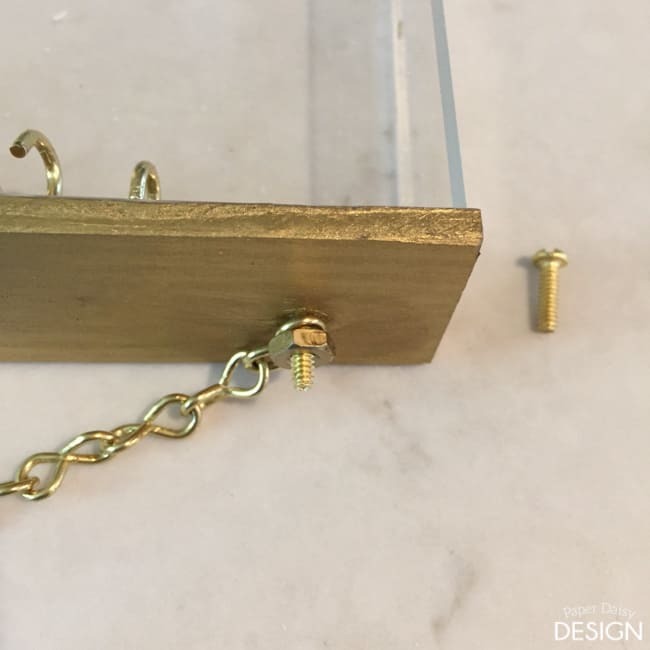 I keep a scrap piece of wood with nails half-way driven into it to set small items like the nuts on while I spray paint. 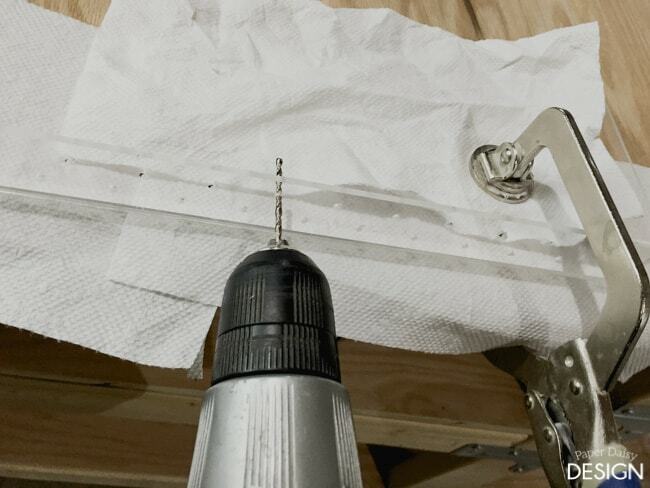 Place the frame on paper towels so that your work surface does not scratch the acrylic. 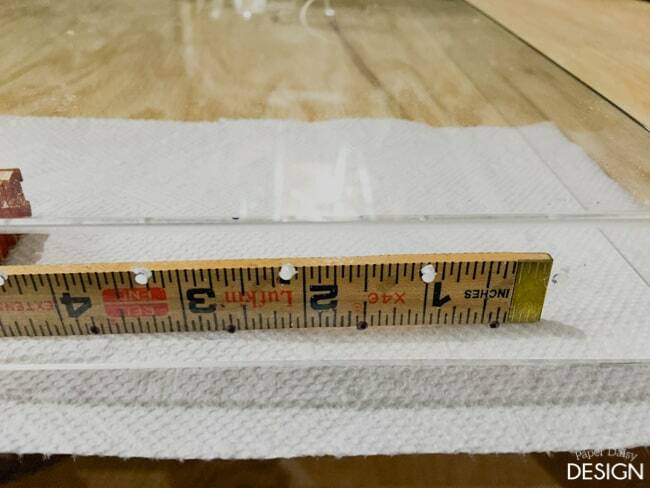 Mark the side edge of the acrylic frame with a ruler every inch with a marker. I started the marks an 1 1/2 inch inside the frame. 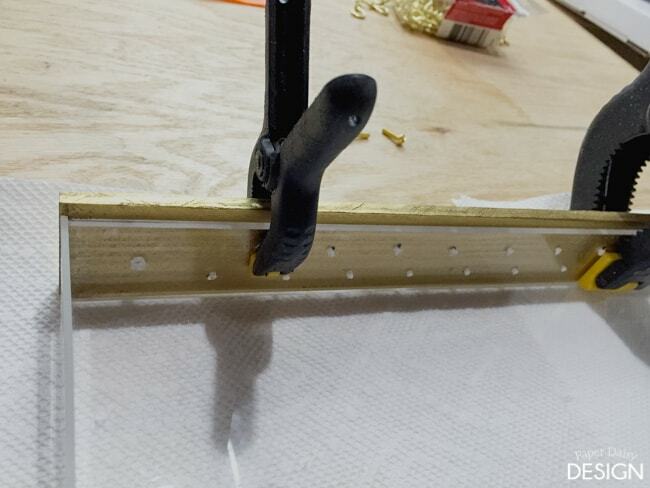 Clamp the frame to a work surface and protect the acrylic with a soft cloth. Drill pilot holes for the hooks to go through the acrylic. Flip the frame over and mark again every 1 inch, but offset your marks by a 1/2 inch down and over. Drill holes for the second row of hooks. I began using a 5/64 drill bit. Once I began adding the hooks I realized it was too small and was difficult to screw in the hooks. I then re-drilled the holes with a 3/32 bit. I’m not certain that you shouldn’t follow this process so that you avoid cracking the acrylic?? Drill holes for the screws to attach the gold painted lattice molding for both the top and bottom of the frame. I measured inside the frame about an inch. For this hole, I used a 1/8 drill bit. 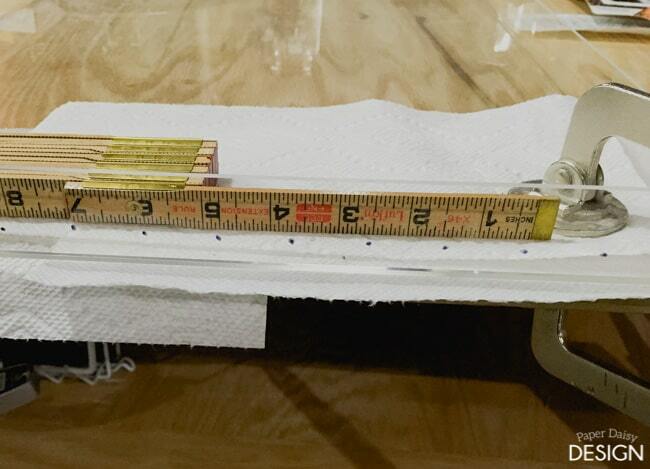 Be sure to use clamps to hold the wood in place for the next steps. Begin screwing the cup hooks into the acrylic. 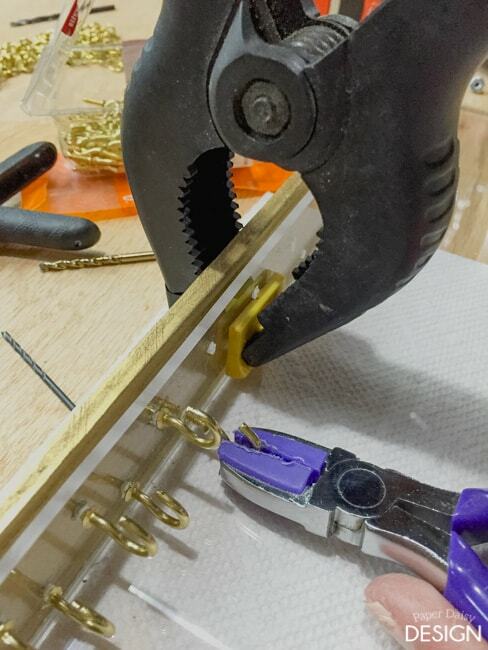 I found using jewelry pliers worked best to get a good grip and not scratch the hooks. Settle in for this step. Adding all 27 or so hooks will take a while. Keep your eyes on the top of the wood at all times. My lattice was just a smidge thinner than it should have been. If I screwed the hooks in too far, it would puncture the top side of the wood. You don’t want to do that. To potentially avoid this mistake, I noticed when I was shopping for the lattice that some pieces were thicker than others, choose the thicker one! Add the 3/4 inch screws to the top of the frame. 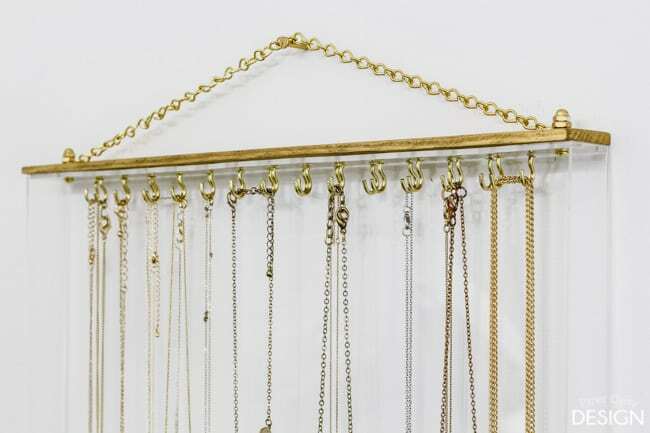 If necessary, cut the brass chain to your desired length for hanging your frame. Mine was about 16″ long and I cut them with heavy duty snips. 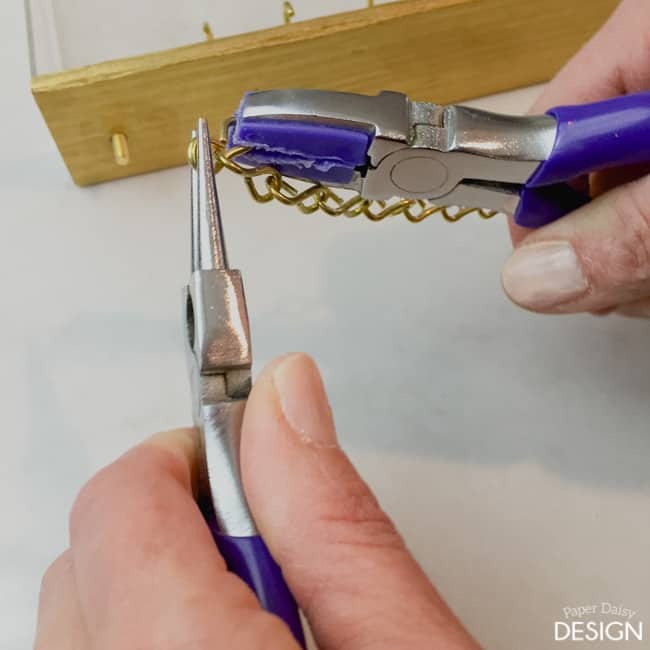 Using jewelry pliers, bend one loop of the chain so that both pieces of the figure eight pieces is flat. This allows the nut and cap nut to fit on the screw. Add the chain and the nut to the screw. Hand tighten the cap nut onto the screw. 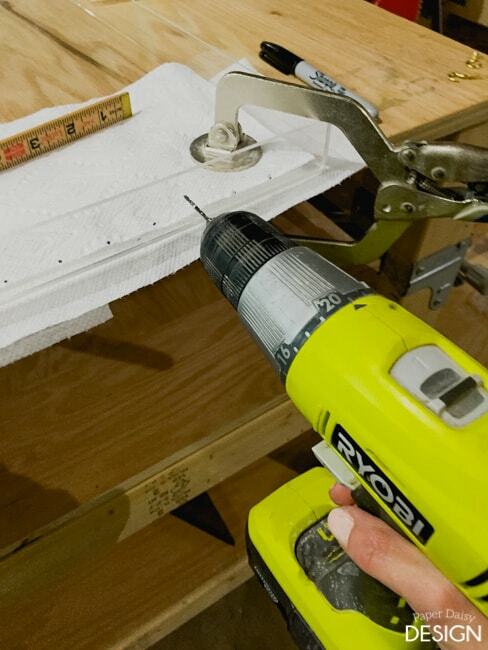 If necessary, you can use a screw driver to hold the screw tight while adding the cap nut. 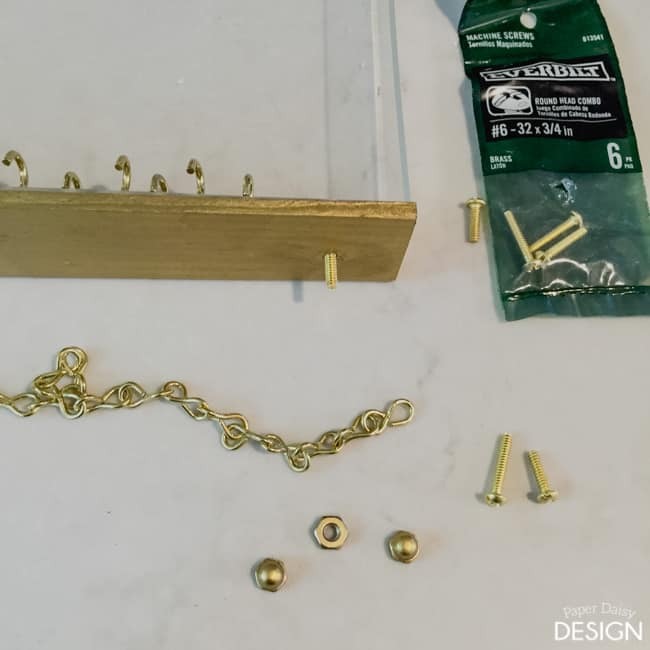 For the bottom of the frame, add the second piece of lattice and using the 1/2 inch screw and cap nut attach it to the frame from the top. 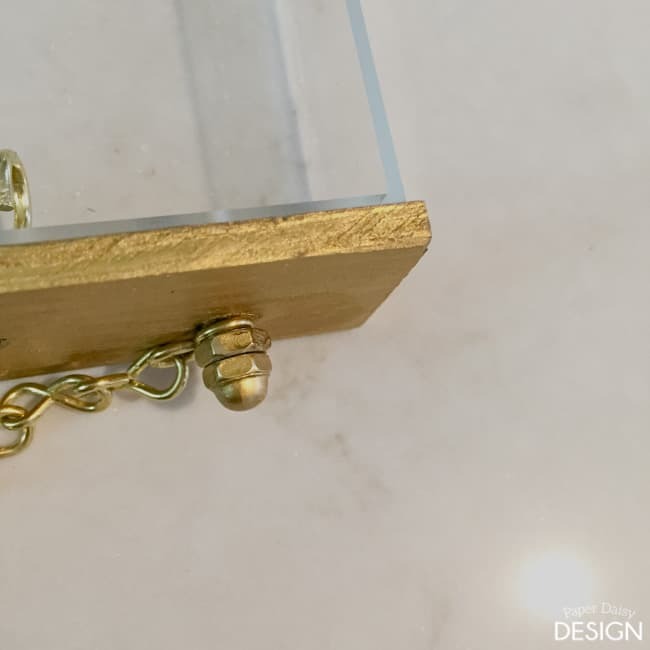 Now you are ready to hang your jewelry organizer. I used a very long nail, spray painted gold to hang the frame. 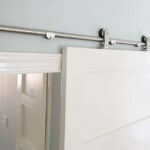 The nail or whatever hook you use, needs to be fairly long to allow for the depth of the frame and the chain to hang away from the wall. We couldn’t be more in love with the way our collaboration turned out. I’d say we make an excellent mother-daughter design team! 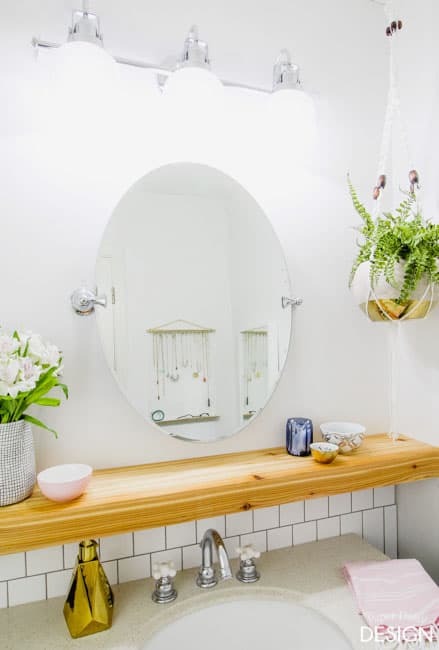 Want to look around at the rest of the bathroom makeover? Click here. So, what do you think? 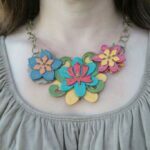 Going to make one for your own pretties to hang in? I’m thinking I might need to make another one just for me! 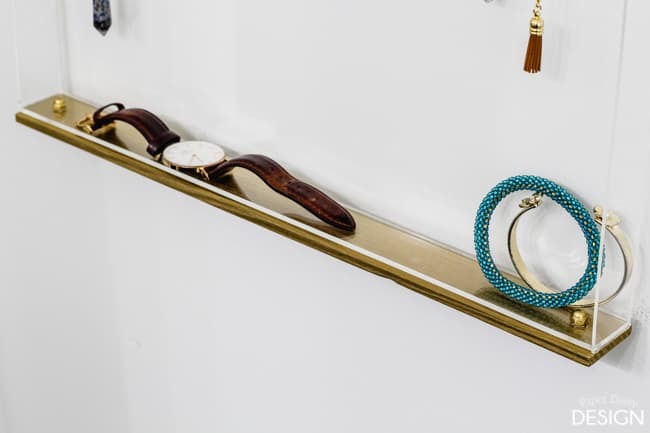 stylish jewellery organisers tips online! I’ll certainly check out jewellery online. 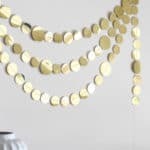 Shopping jewellery online is always easier and cheaper! 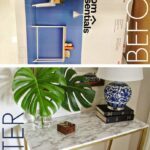 Help, I am not seeing where to buy the acrylic frame. Very innovative design. Seems not so tough. I think I can also make one jewelry organizer for myself.